Photo courtesy of JX Nippon TWO Lubricants India Pvt. Ltd.
Honda Motorcycle & Scooter India Pvt. Ltd., in partnership with JX Nippon TWO Lubricants India Pvt. 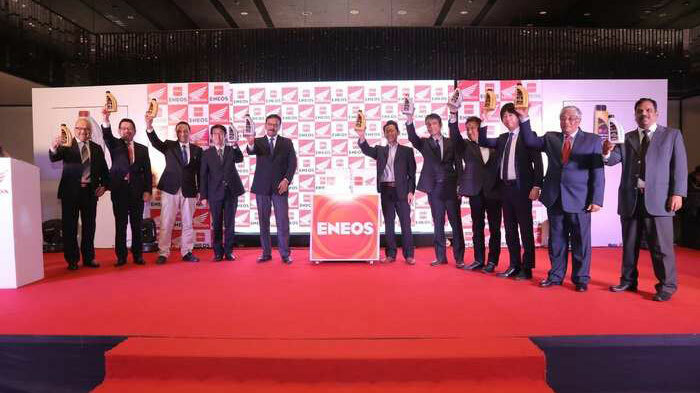 Ltd., has launched ENEOS Honda Engine Oil. JX Nippon TWO Lubricants India Pvt. Ltd. is a joint venture between Japan’s JXTG Nippon Oil & Energy Corporation and India’s Tide Water Oil Co.
ENEOS Honda Engine Oil was specially formulated for Honda Motorcycle’s diverse product portfolio. It comes in two variant: BIKERZ OIL for Honda motorcycles and SCOOTERZ OIL for Honda scooters. The co-branded motorcycle engine oils will be available for sale by the end of January. “At Honda, we believe in putting customers first. Our efforts to ensure quality products and services are consistent and we have taken yet another step towards elevating customer satisfaction. In association with JX Nippon TWO Lubricants India Pvt. Ltd., we have launched ’ENEOS Honda’ engine oil exclusively for Honda two-wheelers. The product will be distributed across the country through vast network of Tide Water Oil, promising a smoother ride for our valued customers,” said Pradeep Pandey, senior vice president, Customer Service, Honda Motorcycle & Scooter India Pvt. Ltd.
“ENEOS is the brand of Japan’s largest petroleum company JXTG Nippon Oil and Energy Corporation. JXTG Japan has collaborated with Honda for more than six decades in developing and introducing technically superior and advanced lubricants for various automobiles of Honda. The launch of this co-branded oil has added another milestone in our journey together with Honda,” said Hiroyuki Morikawa, managing director of JX Nippon TWO Lubricants India Pvt. Ltd. (JXTL). According to R. N. Ghosal, managing director of Tide Water Oil Co. (India) Limited (TWOIL), the new ENEOS Honda co-branded oils will be available across India through TWOIL’s distribution network.